Perhaps you know him as Timothy Spall, but the actor playing Mr Turner is best known in my house for his role as Scabbers, AKA Peter Pettigrew, in the Harry Potter films. I am anxiously awaiting the release of Mr Turner, and have watched the trailer multiple times in anticipation of material for the authenticity and accuracy fires.I’ve also watched The Power of Art again, because I love Simon Schama as the David Attenborough of fine art, and I’ve enjoyed the way that Mr Turner’s titles appear to use a similar color-into-liquid trope as TPOA’s bleeding titles. Just go watch it. Why am I so excited to see Scabbers paint? Because the trailer looks so damn good. The color, the set dressing, the intensity of the colors, all suggest that the film team paid close attention to the material culture of the past, and to those tiny details that create a satisfactory, accurate closed world that helps us achieve experiential and even transcendent authenticity. Of course I enjoy costume drama: you’d expect that, right? And messed up costume and material culture details can wreck a film or TV program for me, but what you might not expect is that there are some films I enjoy despite their apparent inaccuracy. Take the Muppet Christmas Carol. That’s one of my favorite adaptations of the Dickens’ work, because it creates a world true to itself filled with believable objects and characters (even the ones I can’t stand), and returns authentic emotions. Scrooge’s headmaster was never an enormous eagle muppet: but the shabby school room works, much the way Beatrix Potter’s anthropomorphic tales work. 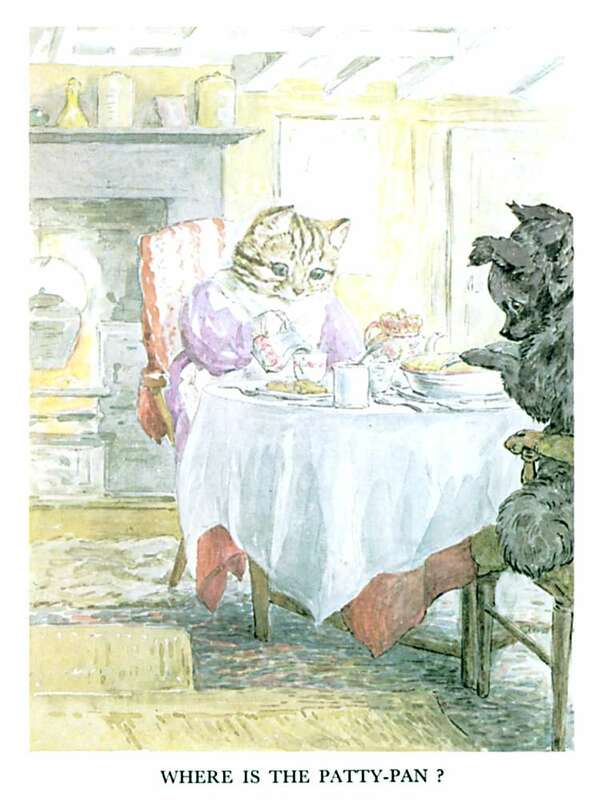 In The Pie and the Patty Pan, Duchess can’t bake– what dog can bake? But we can believe that Duchess is a greedy eater, and might well think she swallowed the patty pan. The touch of hypochondria in a greedy dog is intensely satisfying, I think. Where is the Patty Pan? What does this mean for historic house and living history interpretation? It means furnishing a believable world with accurate clothing, goods, and accouterments, based on primary sources with characters who convey authentic emotions and ideas to create a transcendent learning experience. And that’s why I want to see Scabbers Paint. Because anything that creates a believable historical experience is worth learning from.